Benefits – Jesenia De Moya C.
junio 4, 2015 junio 4, 2015 Jesenia De Moya C.
Did you know that healthy and well-managed coral reefs generate 5 to 10 tons of fish per square kilometer per year? World Ocean’s Day is around the corner and The Nature Conversancy helps to take out the numbers. 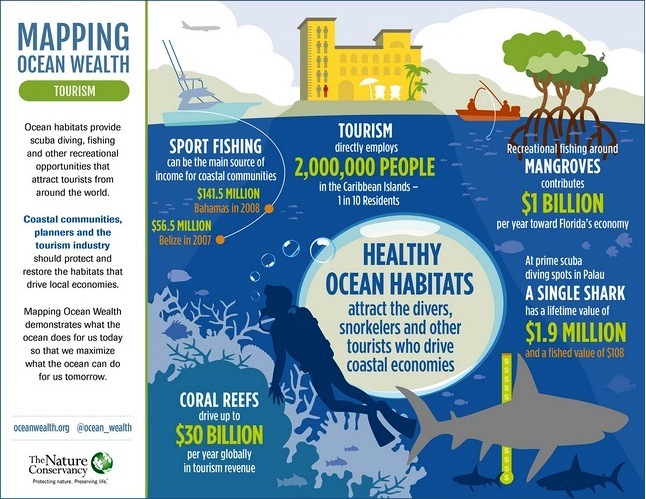 Together with Ocean Wealth, an organization dedicated to evaluating marine ecosystems, they’ve shared an array of infographics that map the benefits oceans and coastal habitats produce in nearby communities. Take a look at the whole series at Mapping Ocean Wealth.